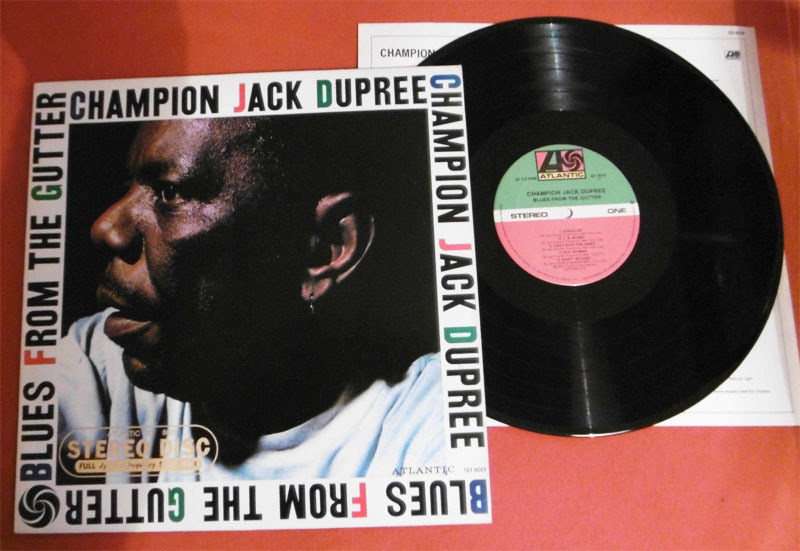 Check out these new and used Champion Jack Dupree vinyl records LPs for sale. Champion Jack Dupree, a native of New Orleans who was also an orphan, learned to play piano from local musician Willie Hall. Hall showed him how to play his driving barrelhouse style, and by the time Dupree was a teenager, he was playing for tips in the French Quarter. In 1930, he lived in other parts of the country including New York, Chicago and Indianapolis, and became associated with other pianists such as Leroy Carr and Peetie Wheatstraw. Jack was also a talented boxer in the 1930s, which led to his nickname of Champion. His professional music career started in 1940 when he recorded for Okeh Records in Chicago, where he flaunted his barrelhouse New Orleans style and became influence on such future musicians as Fats Domino and Professor Longhair. He went on to record for many small labels, and his greatest commercial song was the R&B hit Walking the Blues for Atlantic in 1955. We recommend starting your Champion Jack Dupree vinyl collection with his masterpiece Blues from the Gutter from 1958. Dupree succumbed to cancer at his home in Germany in 1992. Our inventory is constantly changing, so check back often, or browse our list of vinyl from blues musicians.